Arc is continually developing workshop models to suit a host of settings. 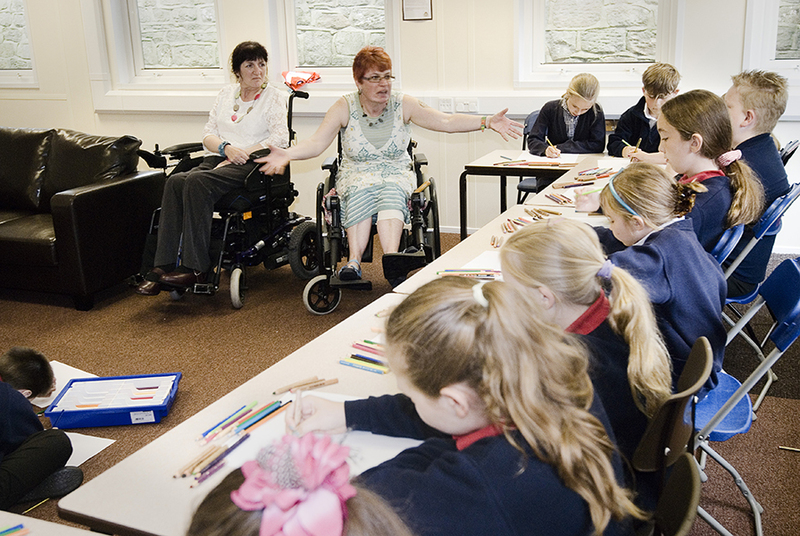 We are often invited to run workshops to raise awareness around disability within schools, the workplace or to run workshops for people with disabilities. We are now part of Leeds City Council’s Portfolio of preferred Arts Organisations. Equal emphasis is placed on the importance of two factors when delivering these workshops. One is that of creativity and the other is to promote disability equality in society as a whole. Our workshops are a combination of discussion performance, and hands on playing. 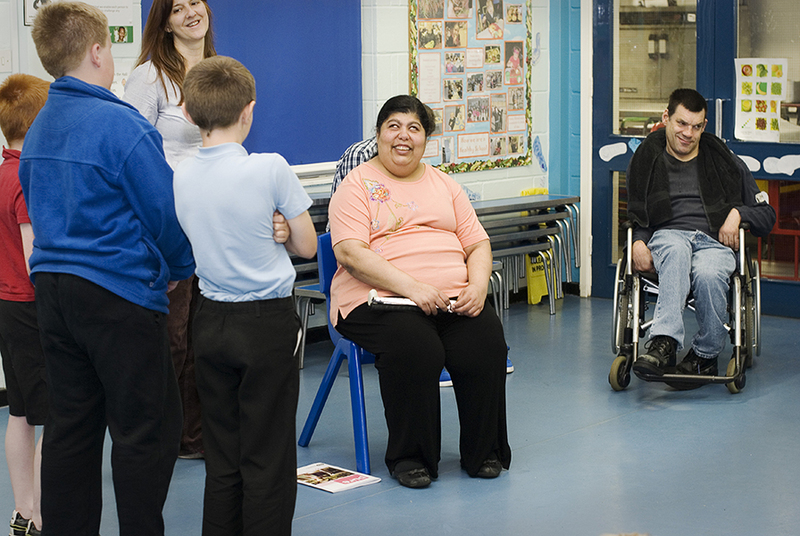 A typical school workshop will start with a whole school assembly, introducing one or two members who will openly discuss their disability with the children and take questions from the floor. These often develop into lively and interesting conversations with challenging questions and astute observations from the children. Musical Arc will then run workshops with smaller groups of children (15 to 20 at a time). 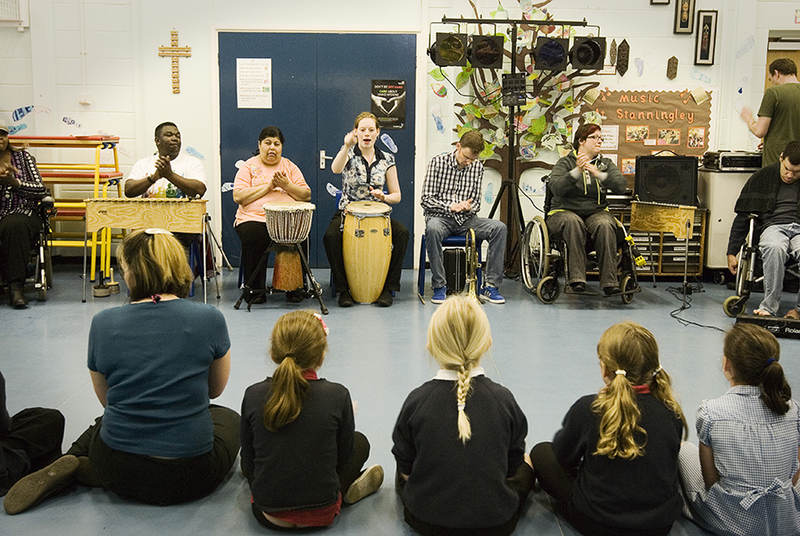 Our workshops are a lively combination of hands on playing, listening and sharing. 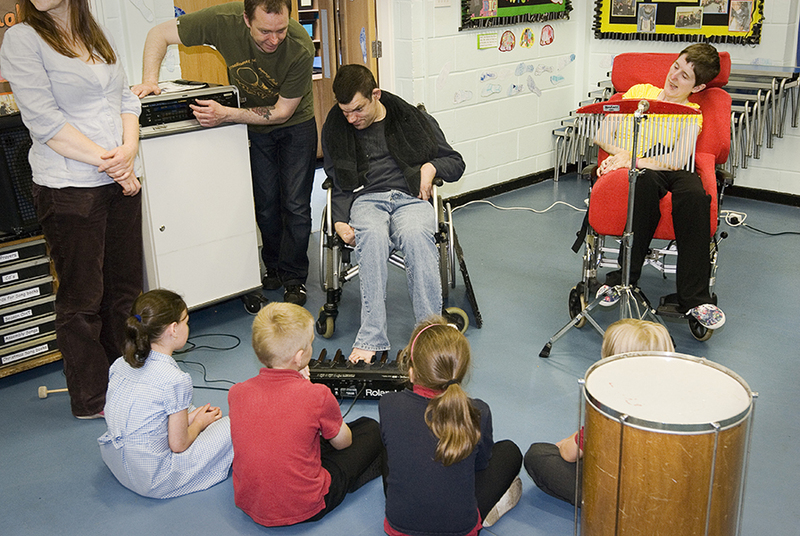 Musical Arc group members each take on a role of responsibility towards the sessions and this is a great way of promoting disability in a positive and creative light. 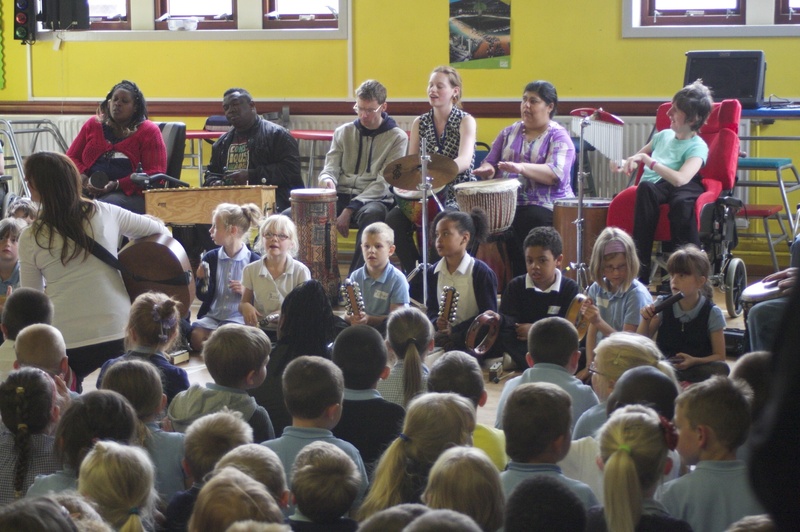 The children will be encouraged and guided towards trying out the instruments and to learning simple melodic structures or rhythmic cycles. As well as working as a group we also break off into more informal smaller groups with one or two children with each member. These smaller group sessions allow more time for the children to interact with members in a more relaxed and natural way and give space for conversation and lively interaction. Within this process there will be singing, rhythm work, melodic structures and improvisation-all the ingredients for great music. We welcome suggestions from schools as to alternative structures for the day and are very willing to come in and meet with you to discuss your requirements. Whatever your needs, we are happy to discuss ways forward and promise to deliver a lively and interactive workshop to suit your needs.